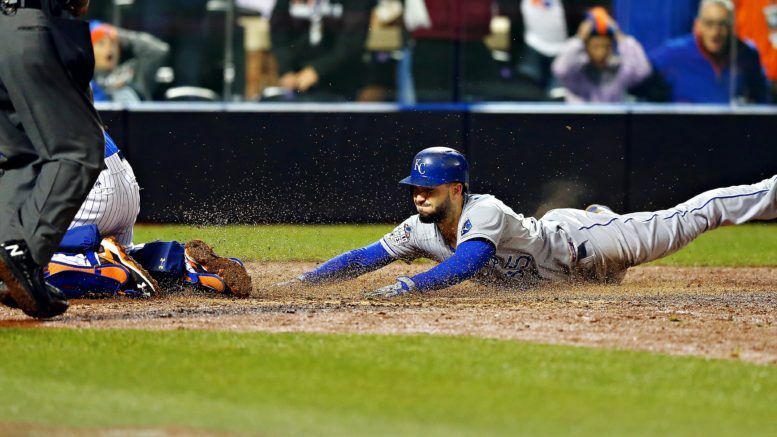 Eric Hosmer's mad dash was one of the highlights of the 2015 World Series. This was a very unmemorable series, except for the fact that Game 5 was delayed for two days before the Phillies finally ended the city’s 28-year championship drought. The first three games were close, including a Phillies’ walk-off in Game 3, but it just felt like the Rays had nothing left in the tank after being taken to the limit in the ALCS by the Red Sox. The incredibly-anticlimactic finish to the series really put a damper (literally) on what had been a great story in the Rays getting to the first-ever Fall Classic. Despite the fact that this ended in a sweep, it wasn’t all that bad of a series. Well, if you like pitching, anyway. The Giants were sizable underdogs against the red-hot Tigers (-175), but got Detroit’s attention quickly with an 8-3 romp in Game 1 on the strength of three Pablo Sandoval home runs. The G-Men then won two shutouts, each 2-0, before a 10-inning win to close out the series in Game 4. Sandoval’s heroics earned him MVP, but it was the Giants’ rotation that did most of the heavy lifting, including Barry Zito topping Justin Verlander in Game 1. The Tigers scored just six runs in the four losses. It feels like we’re doing some Giants-bashing, but that’s not the case. Madison Bumgarner truly broke onto the scene with a Game 4 gem to tip the scales heavily in San Francisco’s favor, after the Rangers had pulled to within 2-1 after dropping the first two on the road. Edgar Renteria was the MVP of this series, capping it with a home run off Cliff Lee in the clinching Game 5. San Francisco surprisingly scored 29 runs in the series, although Game 2’s 9-0 rout was skewed by a bullpen meltdown late by Texas in which the Giants scored seven two-out runs. This redundant matchup, seen previously in 2004, had some entertaining moments, but overall was just an average series. Two of the games played in St. Louis had incredibly bizarre finishes, with Game 3 ending on an obstruction call and Game 4 ending with a pickoff of Kolten Wong at first base. Game 2 was also lost by the Red Sox with some sloppy defense, but they won the series thanks in large part to David Ortiz mashing the ball all over the park, and the Red Sox earned two rather-lopsided home wins in the series, including the Game 6 clincher. Talk about many fans’ nightmare series. The Phillies were the defending World Series champs, but the Yankees are always the Yankees. Chase Utley homered twice and Cliff Lee made history in Game 1’s rout, but the Yanks stormed back to take the next three games. Lee got the series back to the Bronx with a Game 5 win, but New York cruised to a comfortable Game 6 win to close out the series at home. Hideki Matsui won MVP, but he only started the three games played at Yankee Stadium. This series featured a lot of star power, but didn’t live up to its billing. Let me pose this question — would you rather watch a shorter World Series where all the games are very entertaining, or a longer series where the games are all one-sided? That was basically the dilemma for anyone who watched either of the Royals’ two World Series. I’d say generally you still want the longer series, which is why I dropped 2015 to No. 6, but this was actually a pretty fun series despite being only five games. Jeurys Familia had the dubious distinction of blowing three saves, as Kansas City pulled out three wins late. Game 1 started with an inside-the-park home run by Alcides Escobar and ended as the longest game in World Series history. Game 4 involved an eighth-inning Royals rally that was aided by some bad Mets defense. And who can forget Eric Hosmer’s mad dash home in Game 5 to force extra innings? The Royals’ scrappy style of play made this a much more enjoyable series than it looked on paper. People will remember Madison Bumgarner’s heroics throughout the series, specifically Game 7, but the truth is, none of the games in this seven-game set were memorable. Five of the contests were decided by five runs or more (!) and the two one-run affairs were low-scoring pitchers’ duels. Because it went seven, I guess I’m obligated to list it ahead of 2015’s five-gamer, but it’s debatable which was actually more exciting. Bumgarner earned MVP by essentially taking over three different games, and Game 7 did get very heart-stopping at the end when Alex Gordon’s liner into center was misplayed into a triple by Gregor Blanco. I’ll still never understand why Terrance Gore didn’t pinch-run at third for Gordon with a lefty on the mound, or why Ned Yost didn’t just go 3-3-3 with Kelvin Herrera, Wade Davis, and Greg Holland and instead chose to start Jeremy Guthrie. This series was kind of the antitheses of Red Sox-Cardinals or Yankees-Phillies. The two teams with baseball’s longest championship droughts put on an unforgettable Game 7, even though the rest of the series wasn’t all that spectacular. In fact, the best game of the first six was probably the Indians’ 1-0 win at Wrigley Field in Game 3, which isn’t everyone’s cup of tea. Like the 2014 series, five of the games were decided by rather sizable margins (four runs or more). But oh man, that Game 7. Since they’d already waited 108 years, you know it wouldn’t come easy for the Cubbies. Corey Kluber was roughed up in what was his third start of the series, and the Indians had to use their biggest pitching bullets earlier than they would’ve liked. Even though they were able to tie it on Rajai Davis’ memorable 8th-inning home run off a tiring Aroldis Chapman, it would cost the Tribe in extra innings after a rain delay, as Bryan Shaw was touched for two runs in the top of the 10th before Trevor Bauer limited the damage. The Indians scratched out a run in the bottom half, but Mike Montgomery retired Michael Martinez on a grounder to third to cement the win. For as wonderful as this game was, and as much as it felt like a seesaw affair, the Cubs actually never trailed in Game 7. But the grand finale is why it’s ranked higher than it probably should be. I really wrestled with this one. You could easily argue last year’s series was the best we’ve had in a while, but alas, I am ranking it second. Still, it had some incredible moments. It had two of the single best World Series games, with wild extra-inning affairs in Game 2 and Game 5. The Astros won both in heart-stopping fashion, while the Dodgers’ wins in the Series were much less thrilling. What truly keeps this series second on this list is the fact that neither of the last two games were anything special, and Game 7 was very anticlimactic. Houston’s first championship was culminated with a two-run first and a three-run second, and stellar work from Charlie Morton out of the bullpen. I disliked the end result of this series, but it was about as good as it gets. Obviously, Game 6 is the headliner, with David Freese’s heroics paving the way for St. Louis to win its 11th championship (in 2011, with 11 postseason wins). The first two games were low-scoring, one-run games, including a ninth-inning rally in Game 2 by Texas. Game 3 will be remembered for Albert Pujols making history, homering three times in a 16-7 rout. Texas’ pitching shut down the Redbirds’ offense in Games 4 and 5, and Tony LaRussa made a major blunder in botching a bullpen move in Game 5. But Game 6 changed everything. It almost didn’t happen that way because it was rescheduled due to rain, but the Cardinals rallied twice, and on three pitches were down to their last strike in the game. Freese’s triple tied it in the 9th, and Lance Berkman’s RBI single re-tied it in the 10th. Freese then won it with a solo blast in the 11th. Game 7 was kind of a letdown, with the Cards earning a Game 7 win, 6-2. Be the first to comment on "Ranking the Last 10 World Series"